There is quite a bit of open water. Ed did a fly-over and actually landed on the overflow, verifying that it will be mushy by the time Sunday rolls around. You sound so confident, determined and at peace at your decision.. I am glad for you...I've got that feeling u will be in the top 10 that come in first. Titanium ... I live in Juneau. I'm used to swimming while pedaling (sometimes literally), but not when it's 0 degrees out. I considered bringing a pair of NEOS but the stupid things already have holes in them. (I just started using them last March.) Plus the soles are terribly slippery on any kind of ice. Still, I have a fair amount of confidence in my Wiggy's waders. Good traction on the bottom. I'll just strap 'em on and leave 'em there. Have fun Jill. Wish I could have joined you guys up there but it was a bit too long a time to stay up in AK. Hope the overflow proves to be not as bad as predicted. Have a great time Jill! Good luck and be safe. I look forward to hearing all about it. Sounds like quite an adventure you're planning. Have fun! This is my first time getting involved with reading someone's blog. All that comes to mind when I read your articles is "wow." Like many of your fans that have said on here, you are inspiring and an amazing individual. The photos are breathtaking, serene, and just make me realize that there is life beyond the boarders of my hometown of TX. I look forward to reading more of your adventure. Safe return home. Thanks for your time. Pugsley has been waiting months for this funventure !! With all your past experience it would be a shame if you pass on this race. It's your kind of fun. The only regret in life should be what one doesn't do, not what one does. Go for it- go for yourself, go for Pugsley,... go for us, we, your loving audience are rooting for ya! Great! HAve you ever considered Bunny Boots? Everyone swears by them as they don't freeze wet feet! Ugly as sin...and big as clown shoes, but the only way to save your feet, friends say. It's musher wear for sure. Julie ... just about nobody in human-powered endurance winter sports uses Bunny Boots, and the reason for this (I've heard) is because they're terribly awkward and uncomfortable to walk in. Plus, because they don't breathe at all, they hold in every ounce of sweat and wet feet start to chafe and blister. Of course, mushers do their fair share of running as well, so it's probably a good question why cyclists don't use them. (Maybe they're also quite heavy?) I myself have never tried them. Chris ... I just looked at a bunch of race course photos and I was blown away. This area looks so much more incredible that the Susitna Valley. I will hopefully have more to report about it later, but so far this definitely seems like the Alaska 100-miler to do should you ever consider coming back for a "shorty." :-) Awesome job in the ITI, by the way! Jill - this is Julie M! haha - I accidentally came across this googling my name for something else.. you are talking about Julie Perilla, the Julie from Anchorage! 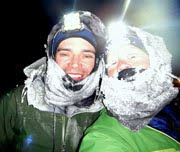 I am the one from Fairbanks.. funny thing is both of us Julies are from PA and ice climb/run too! How's that for confusing?! You did ride by me a few years ago in the 24 hours of kincaid, though! Looking forward to meeting you Saturday and safe travels! Doh! I hate it when I get names wrong. Thanks! Look forward to seeing you again! I just got back from skiing the last 30 miles of the course - the overflow is not all that bad (no wet sections of any note).. however we did not do any of the "bad" sections - the section labelled "the ice lakes" in course description can be quite wet, as can a couple of the sections leading up to the cache mt divide.. The course is quite beautiful - most scenic spots start at around mile 45 or so, and go for the next 30 miles - if your zippy you can make these sections with enough daylight to enjoy the views! my endurance racing days are over due to serious injury, but i hope you dont mind me living my dreams by-proxy lol. Jill - Good luck with the race! I think it's a great idea to have a big hurrah race to celebrate your move! Have a great time! I'm sure you're totally prepared to have a fun, safe, dry ride. I can't wait to read about it! 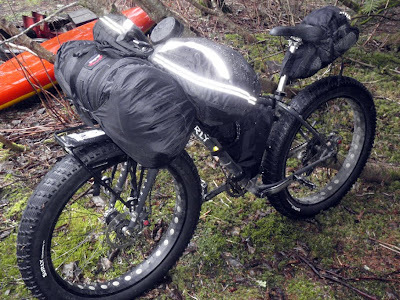 ThanX for the photo of puggsly and the discription of gear and how its loaded...love the giant tires. While I love your blog I think of myself as doing the kayaking version of the sort of cycling your prefer. I like it cold, and wet, and messy. That said some friends have roped me into a cycling/camping trip. It will be the first time I ride a bike loaded with gear! send me good vibes, I will be thinking of you and pugsley! Good luck Jill - you will have a super race, I am sure. It should be a lot of fun - keep those feet dry - you don't want any more frostbite. We will follow your race. Amazingly well planed. And it seems with winter bicycling you learn everytime you venture out. Good luck, have fun. Ever since Anonymous made their comment a while ago you stopped doing the pictures with you in them. I miss that.